If you need to hire a carrier to transport your exhibit, select a trade show shipping company that has specific experience in handling, shipping and delivering exhibit materials to show venues. Begin the selection process by contacting the event sponsor to inquire whether there is a "preferred" carrier designated for the show that may extend special rates or services to exhibitors. You may also get shipping company referrals from your trade organization contacts and other professionals in your industry. 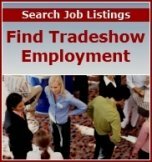 An internet search for trade show shippers and logistics experts will also yield names of carriers to consider. The number of years the company has been in business. A detailed description of services provided. The type of communications system the company uses to track real-time progress of exhibit shipments. The type of packing that takes place to secure crates and other exhibit items. Whether the carrier has air-ride suspension that helps protect your items from road vibration and possible damage. A written price quote that covers all of your trade show shipping requirements and transportation time. A list of references from other exhibitors who have used the carrier’s services. Once you have selected a carrier based on your research, review your exhibitor’s manual for the show’s shipping, delivery and timing requirements. Advanced logistics planning will help save costs, as well as help ensure adequate time for set-up at the show venue. If you wait until the last minute, you may pay a surcharge for expedited transportation and delivery. When you schedule your shipping, make arrangements at the same to have your carrier handle return shipping of your exhibit crates and items. To help ensure smooth transport, prominently label all of your crates, boxes and exhibit items. In addition to your destination address -- and the name of the actual event in which you are participating -- include your company name, address and phone number on every crate and box. Also, you will likely want to insure your exhibit cargo any time you transport it from storage to a show site -- and back. Once your exhibit items arrive at the event venue, there are specific procedures your carrier must follow for delivery to the loading dock. Instructions are included in your exhibitor’s manual so be sure to fully brief your carrier on arrival details. Delivering your items to your reserved booth space. Removing empty crates and boxes once your exhibit is assembled before the event. Returning the empty crates at the close of the show. Arranging for delivery of your packed exhibit crates and items to the loading dock for carrier pickup. For more details on trade show shipping and on-site logistics, click here.